This book is subdivided into three main Parts. The common spirit in these parts is to provide, at the beginning of each, a comprehensive introduction into the subject treated, followed by specific aspects pertaining to the modelling and/or measuring particularities arlsmg from the investigation of photonic devices for telecommunications. Some of the devices treated here can be considered as widely known and well established. Others are rather new and their potential for applications is not yet fully exploited. The methods to model and measure photonic in this book and the comparison of results obtained devices and structures outlined by applying such methods are likely to interest both the engineer investigating the of a device in a system and the engineer looking for new ways to explore behaviour the possibilities offered by emerging devices. Many authors have contributed to this book. There are two main reasons for this. 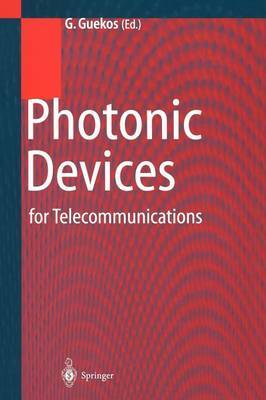 in photonic device research, modelling First, the book addresses two broad fields and measurements, for which a vast knowledge exists in many research groups that was not integrated in a book before. Second, a significant number of laboratories decided to closely co-operate in order to gain additional information on merits and drawbacks of their own methods for simulation and experimentation of devices as compared to the methods used by their colleagues in other laboratories. The outcome are new aspects and approaches that would not have been investigated in the absence of a framework for a co-operative programme.